Flappy Bird is Like the Water Levels in Super Mario Bros.
Where have we seen those green pipes before? Flappy Bird is a rare breed of video game. It debuted last year and almost nobody cared. Now it's the top game on the iOS App Store. It's the sort of viral phenomenon that is bound to flap its way into pop culture, as everyone has his or her own high scores and personal opinions on how to improve yours. A friend thinks it's like Dark Souls for Xbox 360 and PS3. A cool comparison, but we think it's like the water level from Super Mario Bros. Think about it. Green pipes galore (very Mario like), and you must constantly tap to keep the bird ascending (in Mario's case floating). Remove a thumb from the NES controller and he sinks. Do the same in Flappy Bird, and it's game over. 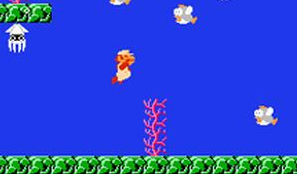 Granted, Flappy Bird doesn't have to worry about enemies and he/she can't fly backwards, but it sure takes us back to the NES days, or any Mario game, for that matter. All the water levels play the same. So what's your Flappy Bird high score?